With the “Inceptor GRX” industrial climbing helmet, the manufacturer SKYLOTEC has developed a solution offering many impressive advantages in terms of criteria such as comfort and ergonomics. The new range of helmets features an EPS core with well-designed interior padding and the maximum permitted ventilation openings, making it comfortable to wear. Various accessories such as hearing protection and headlamp can also easily be added. The wide range of adjustment options makes the “Inceptor GRX” suitable for a variety of applications in trade and industry. People working in the construction industry, at heights or in sewer shafts, as well as in many other branches of industry, have an above-average risk of head injury. In these kinds of work situations, they must therefore wear a helmet as part of their Personal Protective Equipment (PPE). 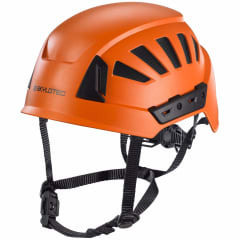 SKYLOTEC offers reliable protection against head wounds, concussion or even skull fractures with its new “Inceptor GRX” industrial climbing helmet. The helmet features optimum shock absorption in the vertex and lateral areas of the head. It also offers high resistance to penetration by sharp objects. The family-run company, which develops and manufactures its products in Germany, has come up with a PPE solution that focuses on users’ requirements when it comes to comfort and ergonomics. After all, a perfect fit and ease of use are important criteria to ensure that the helmet will be worn at all. The cleverly designed details include, for example, a clasp on the chinstrap, which is easy and convenient to open and close. The clasp closes automatically thanks to a magnet, so it's impossible to trap the skin on the neck or chin. The “Inceptor GRX” is also available without chinstrap – for example for activities carried out exclusively on the ground. An exchangeable adjuster sits deep on the back of the head. This holds the helmet securely in place and prevents it from slipping when the head is tilted. Particularly for people who have to wear their helmet for several hours a day, even during hot weather, the “Inceptor GRX” is a real relief. Continuous ventilation shafts in the EPS core of the helmet and large ventilation openings ensure good air circulation and pleasant head temperatures. The “Inceptor GRX” also scores points with clever details that make handling easier for workers. These include a multifunctional gear rack, to which individual hearing protection, for example, can be attached. A 30 mm Euroslot in the front or four helmet clips allow a headlamp to be attached. The enhanced standard fittings ensure that any “Inceptor GRX” climbing helmet will fulfil the requirements of various work situations in trade and industry and therefore can be used in a variety of fields of application. An additional advantage: components such as chinstraps, adjusters, interior padding and gear rack are exchangeable and can therefore be removed separately for cleaning and replaced individually when they wear out. Highly reflective models are also available for enhanced visibility in the dark. Other accessories such as “Mute 26” hearing protection and textile components, which can be added to protect against increased UV radiation, complete the new SKYLOTEC helmet range. “Inceptor GRX” fulfils the impact and shock absorption requirements of the EN 397:2012 standard and comply with the EN 12492:2012 standard for mountain climbing helmets. SKYLOTEC also offers special “High Voltage” models, which are certified according to EN 50365:2002 and therefore come without any ventilation openings. This standard applies to electrically insulated helmets for working under voltage or near live electrical equipment up to an alternating voltage of 1000 volts. These kinds of industrial helmets are therefore suitable for employees working on power masts in the energy supply industry. In combination with other insulating PPE, these models can prevent dangerous electrical shocks through the head. All models are available in black, white and orange.